As is the ritual on the first day on track for the weekend, teams and drivers took a "slow and steady" approach to the first session, lots of install laps, working out the bugs, testing systems, and in the case of this year, testing repairs and tweaks made to the track. In particular the repaving of most of the surfaces, and the late reworking of the configuration of Turn 3. 4 laps in, Will Power came into turn 10 too hot, and the backend of the car slide out from under him, making hard contact with the wall coming out of the corner, destroying the entire right side of the rear wing assembly and sending lots of debris all over the track. The Holmaltro safety team was able to get him re-started, and he got back to pitlane under his own steam. He would return to the action almost immediately, with seemingly only cosmetic damage to the car. Marco Andretti would end the first session at the top of the time sheet with a lap of 1:03.756. With Kanaan, Dixon, Hinchliffe, and Pagenaud rounding out the top 5. Again, the session was brought to a halt early in on, with Takuma Sato over cooking it into turn , braking hard but to no avail, and stuffing it into the tires nose first. Once the cars got going again, it was again evident that the Honda's were pretty happy, the Chevys not so much. Some complained of brake issues, Conor Daly continued to be plagued with troubles of his own, though teammate Munoz made some headway, and the Ganassi crew showed again that the switch at the end of the season from Chevy to Honda was not a hinderance at all. 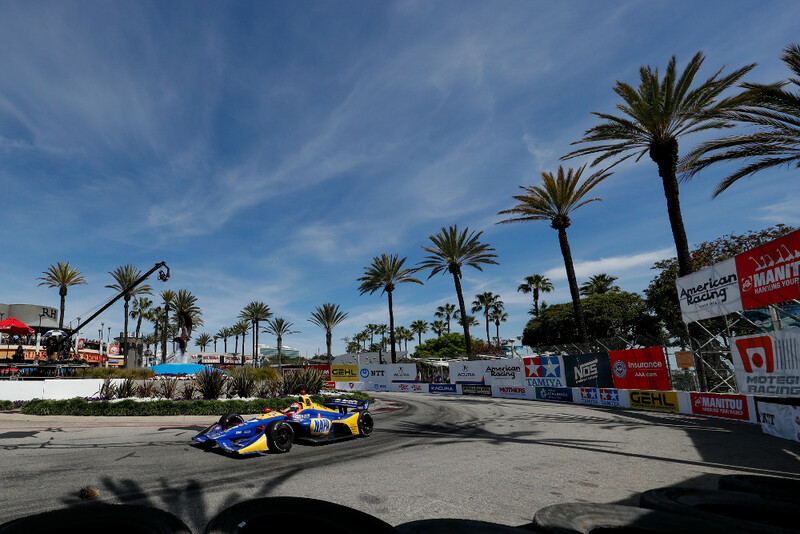 In fact Scott Dixon would end the first session at the top of the time sheet with a lap of 1:02.559. With Power, Kanaan, Kimball, and Bourdais rounding out the top 5. - The overwhelming sentiment is "it's about bloody time". With the unbearable political cesspool that the world has been swirling in, particularly since January, it's nice to finally have something to talk about and distract us. May all of our political discussion moving forward be "racing politics"
- Key players from 4 major components that make up the foundation of IndyCar racing, Chevrolet and Honda, Firestone and Dallara – announced multiyear extensions at a press conference on Friday afternoon. Though specific dates weren't confirmed. - There was a massive show of support for Susie Wheldon, at the grand opening of her new store "Verve". Not only did a hefty portion of the IndyCar field show up, but IMS provided the car and the Borg Warner Trophy won by her late Husband, Dan Wheldon, who is honoured in the store by a giant Lion mural, a tribute to his nickname "Lionheart"
SIMON PAGENAUD (No. 1 PPG Automotive Refinish Team Penske Chevrolet): "I feel good about the PPG Chevrolet. I think we made good progress throughout the sessions and collected a lot of good data. There is more speed to find and I feel we'll be able to do that and be ready for the qualifying session. It's important to qualify well to make race day a little easier. It's awesome to be at the track again for an actual event. The atmosphere here is tremendous." JOSEF NEWGARDEN (No. 2 Verizon Team Penske Chevrolet): "It was a good day for the Verizon Chevy team overall. We learned this morning that we had some work to do and I think we improved in the second session. The track behaves a little different in spots, so that was something to get used to. We'll go back to work tomorrow and get into a good place for qualifying." HELIO CASTRONEVES (No. 3 Hitachi Team Penske Chevrolet): "It felt really great to get into the Hitachi Chevrolet today. The day went well. We had some learning to do with the track, but that got all worked out. I'm just excited to get the season underway." CONOR DALY (No. 4 ABC Supply AJ Foyt Racing Chevrolet): "It wasn't an ideal first day. We had some issues in the first session. We got running in the second session and we're still a little bit behind. We tried some things with the red tires. We don't have the pace we need yet but that's why we work together and figure out the best set up for the ABC Chevy tomorrow." MAX CHILTON (No. 8 Gallagher Honda): "I think we started strong. Everyone is dealing with the change to the track in Turn 3, and so it is what it is. Top 10 in the first session wasn't bad, and we'll look to continue to find ways to improve the Gallagher Honda in practice tomorrow morning." SCOTT DIXON (No. 9 GE LED Lighting Honda): "I think it started generally well. This weekend, the car, we've done some good homework in the offseason for ourselves, how the competition stacks up. I think tomorrow will be interesting once the other competitors turn it up. We'll see where it goes. Generally comfortable, in a different rhythm from what I had here previously with the car, with some fundamental changes we made through winter. It's Friday. It doesn't pay anything, doesn't mean anything. Hopefully what we learned today, we can continue on and help improve the car come tomorrow, and more importantly for the race on Sunday." TONY KANAAN (No. 10 NTT Data Honda): "I think a P2 and P3 result in both practices is a good way to start the weekend, but I wouldn't say I'm comfortable yet with the car heading into qualifying. I think we definitely have some things to work out tonight and focus on tomorrow during the morning session to make sure we're on the mark for qualifying." WILL POWER (No. 12 Verizon Team Penske Chevrolet): "It was about the same lap I (crashed) last year, can't believe I got in the wall again. It was a good session (in the afternoon). Definitely made some progress on the car. Great to be here. Great to start the season off. A pretty long offseason. Yeah, the grid looks pretty nicely mixed up there with Honda and Chevy, great competition." CARLOS MUNOZ (No. 14 ABC Supply AJ Foyt Racing Chevrolet): "We made a lot of progress from Practice 1 to 2 - the ABC Chevy was much more competitive. I think we were in the top 10 the whole session. We need to improve but everyone is very close. We're not 100 percent happy and I think we can still make changes and improve it. We'll see how it goes." GRAHAM RAHAL (No. 15 Steak 'n Shake Honda): "It was a frustrating day. We are trying to get through a lot and obviously struggling to find our way here a little bit. There is a lot of work to be done. We have to find some pace for sure for qualifying otherwise we're going to have to create some magic in the race. We will work hard to pick up some pace and move the Steak 'n Shake car further up the time sheets." SEBASTIEN BOURDAIS (No. 18 Dale Coyne Racing Honda): "It was a good recovery for us in Practice 2. Our car was surprisingly out of its window this morning so that was a disappointment, but we recovered pretty well this afternoon with P5 in practice. The car is still not dialed in to what it can do, so there's definitely more potential. It feels like the Firestone reds have helped us quite nicely. I don't think we really got the best out of them either. Overall, we still have some work to do, we need to identify the little issues and try to work on it and get it where we want it to be for tomorrow." ED JONES (No. 19 Boy Scouts of America Honda): "Today was a good day. It was challenging but I learned a lot. We're going to make some changes overnight and I'll be in a much better position tomorrow. It's hard, but I felt much more comfortable in that second session and I'm looking forward to seeing how tomorrow pans out. Everything is a bit better compared to what I've been used to here in an Indy Lights car. You're faster, you're breaking a lot later, there's more corner speed. On a street circuit, it's tough to do that initially because the margin for error is so small. As much as you want to push as hard as you can and find the limit, you also don't want to lose any track time by putting it in the wall. It's a difficult situation but I think we did well today." SPENCER PIGOT (No. 20 Fuzzy's Vodka Chevrolet): "We made some good changes. There was a lot of people out there at the end when we were trying to do a lap on red tires; it was crowded on track. I feel like we are better than our time shows, so we are going to make a few changes and make a few things better for tomorrow." JR HILDEBRAND (No. 21 Fuzzy's Vodka Chevrolet): "First practice today, I don't think anyone got exactly what they were expecting. The track just seemed super low grip. For me, that was not my expectation and then it was not our expectation as a team in terms of what we were going to get out of the car. We reset after the first practice; I went back out with some things to work on myself and we made some good changes going into the second practice session. We got ourselves back into the window. We've got a little bit of work to do but we're in the midst of a good group of cars. Our aim tomorrow is to break through out first qualifying group and get to that top 12. It feels great to be back in the car and the team's doing a great job, hopefully this is a good building block for us to start the year." TAKUMA SATO (No. 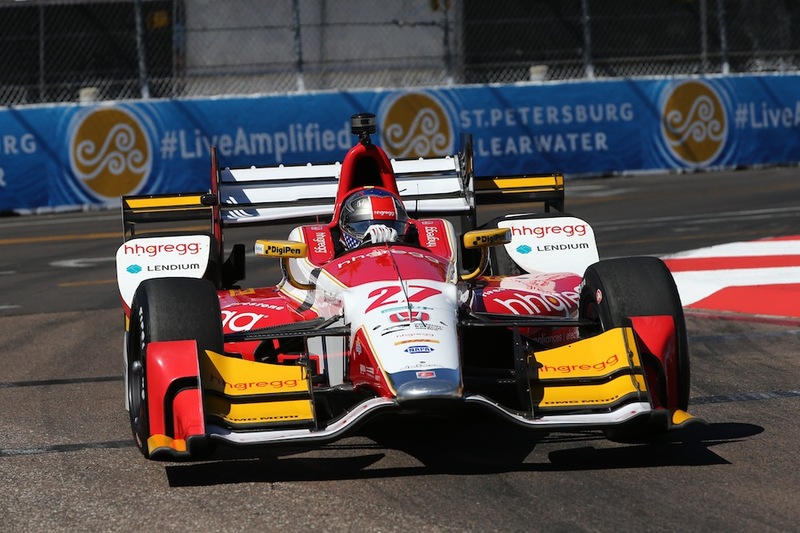 26 Andretti Autosport Honda): "It's good to get back in the car. It was a very short first practice today, a 45-minute session. We showed some strength. In the second session, we had a problem and I didn't put a time down. It's difficult to say. I am excited to come back here and to get the season started. Hopefully we had a good day tomorrow; I have a lot of things to catch up on." MARCO ANDRETTI (No. 27 hhgregg Honda): "Not a bad day for the hhgregg team. I had some traffic there on my quick lap, so I think our potential is greater than where we ended on the time sheet. We'll make some small changes for tomorrow and hopefully qualify inside the Firestone Fast Six. Overall, I'm fairly happy. I think me having a clear head and just driving the race car, not overthinking things, is a weight off my shoulders." RYAN HUNTER-REAY (No. 28 DHL Honda): "The second session was a bit of a bummer for us with some lost time. We went out of pit lane on the install lap, and I could feel something wasn't right, the brakes were hardly working and my foot was going almost straight to the floor. We had to come in and swap the entire brake system, so we sat in pit lane most of the session. It's unfortunate but we'll get with our teammates here and hopefully come out tomorrow swinging. It's still early, but our strategy for the weekend is to get the DHL Honda up to the top of the podium. We've finished runner-up here a couple of times and have finished third. I'm ready to finally get a win in my home state of Florida." CHARLIE KIMBALL (No. 83 Tresiba Honda): "That's a solid first day here on the streets of St. Petersburg. I'm pretty happy with P8 and P4. We need a little bit to catch our teammates. The Honda cars are obviously working really well, so we'll see how it goes tomorrow afternoon when the times really count during qualifying. The Novo Nordisk guys were solid all day - quick on the changes here in pit lane. Eric (Cowdin, engineer) is doing a really good job giving me what I need to drive the car. This track is always a lot of fun, but I think it's especially enjoyable this year with the repaving." ALEXANDER ROSSI (No. 98 NAPA Auto Parts/Curb Honda): "I think it was a pretty decent day. We didn't get a clear lap on the (Firestone alternate) reds at the end of the day, so our time on the primaries was pretty respectable and I think it's OK. There's still a little bit to get from the NAPA Auto Parts car; I genuinely think we are close to the window. I'm not as unhappy as the time sheet may reflect, but there's a gap to the front. We are pretty solidly into the top 10, but getting into the top three is something we need to work on overnight."